I love you, Chantal!!!! You’re just perfect. gorgeous dress on you! you look really good in florals. I love the lighting in these photos too. The boots are amazing as well. Fantastically ’80s! I love it. I saw Yeardley Smith on the Food Network last night wearing an awesome floral dress underneath a cardi w/more floral detailing. It rocked and made me lust for some serious florals. Nice Ebay finds, I need to get a better handle on scoping out those online deals myself (I never want to pay for shipping- ha). The boots are a fabulous find – look divine with the dress – beautiful photos! Love these photos, they belong in a magazine!!! That dress is a great find! You have such great style!! love this girly look, and esp adore those boots. I have been in search for a while now for the perfect pair of these! love your boots! And the lighting in these photos is perfect.. you look really beautiful. Ahhh what an excellent buy 🙂 The dress fits you so well, you look adorable! really cute and gorgeous dress,coco…!! !so girly yet rocks!!! That dress was made for you….it looks very cute on you. The way you styled it was right on. I jumped on the floral trend. I bought and wore the cutest dress. I need to post pictures but my camera is being lame. I love this outfit! So fun and feminine with alot of edge! Adorable concept! i love how you pair it with the boots. You’re true to your style. WONDERFUL. I adore this outfit <3 You’re so beautiful ! you are so cute i love this outfit! Such a gorgeous look! i love ur dress and for 15 bucks, u cant beat that! this is fabulous! it is kinda warm, but getting cold! love the dress & the boots are AMAZING. love your blog–you’re added to my list. Cute dress! Love the boots with it. Gorgeous as always. It’s great to see some floral again! You really look gogeous!! I love your dress and your boots so much!!!! you are always way too cute!!!!! Really cool and easy outfit! Is lovely! Like the photos and the boots! Cool find! As gorgeous as ever.. that floral dress with those boots is such an amazing mix. Love it!! ¡Qué guapa chica! Ese vestido te sienta genial, de verdad. Y bueno, las botas… ya ni te cuento, me encantan, las quiero igual jaja. Dios, quiero unas botas así. I like the light in the photos. I love this dress, much better than the pink one! the boots are awesome too! u look great! You’re so lucky to have this wonderful fall, we are cold in BCN! Super leuke foto’s! & je ziet er weer prachtig uit! Je ziet er echt super uit! Ook super mooie foto’s! Ik ben overigens best jaloers dat je in New York woont, haha. Ik ben er vorig jaar augustus voor de 2e keer geweest en het was zo geweldig. love both the dress and the shoes! you look so cute! Absolutely adorable outfit. and all for such cheap prices! Waw i’m so in love with your boots ! You’re really lucky to have found some on ebay ! I don’t know what to write to find some like that haha and the dress is lovely ! Lovely, you look so happy all the time! When was this? Here in CT it was pretty chilly all weekend, yet we are only 45 minutes away… Strange! Wow that dress is such a great find! Love the floral print. Oh gosh, you look so gorgeous + those boots are just mmm….. This is fantastic, I love your boots. I’ve been eyeing a number of Mink Pink items as well, they do florals so well! you have this perfect mix between a girly and boysh look that goes so well with this outfit! i like this. makes you feminine. I simply just love floral print, and the way the light hits you looks beautiful! i bought this minkpink dress and i washed it and the color faded a little bit but minkpink have the cutest floral dresses ever!!!! Wauw, wat een geweldige schoenen! Ze lijken precies op schoenen die ik bij Paul Warmer in Amsterdam heb gezien vorig seizoen! i love your boots! nice to know you’re in a so much better temperature than i am :(! LOVE IT !, and it looks so confortable with boots!. you look great ! you look perfect…the hat and boots are the perfect complement! Love your dress and your boots!!! you really are totally gorgeous and so are the photo’s on this blog. who takes your photos for you? whoever they are seems to be a talented photographer. Great pictures – gorgeous look! I think your find is better…. Wow what a pretty dress! You are obviously a great bargain hunter on ebay! I love that you smile on all your pics, it makes a lovely change to a lot of blogs (including mine!)! Love this! You look adorable and so happy. The lighting is wonderful too. The outfit is so cute, you look gorgeous! Love the dress & the lighting is amazing. you have the best looks! i think your blog is my faaave of all b/c i really relate to your original grungy style! i looove this look as well, im sure i’d wear this amazing dress in a very similar way! i love your finds, and just everythiiiing! Beautiful dress and gorgeous taken photos in the sunlight ! wow what great finds, the photography is really nice as well. your photos make me miss new york so much! I would love to wear that dress but in Spain is really cold now, anyway is gorgeous! It’s crazy, it really look like spring ! And it’s good to see a fresher look when we’re wearing scarfs and gloves and coats… !! AHHH!!! I love those kind of dresses! I’m very excited to announce a The Stiletto Effect and Shopbop.com International Giveaway. Go to http://www.thestilettoeffect.com to enter. Hey Chantal! I have tagged your amazing blog! FIRST TIME I’M POSTING YOU! dont know how I hadnt visit this blog! my humble opinion: muchmuch better the ebay dress!!! I lovelovelove it! Oh my gosh, I love that dress! What a great ebay find! i love this. die laarzen zijn echt super! I just came across your blog and I think is so cool! Love your style! God i love those boots. Been looking for them for a long while but nothing!!! amazing look, I love indian summers by the way. adorable dress and I love it with those low key boots. Beautiful dress! U look amazing in it. that dress + boots are total perfection. neeeeed a dress like that!! you/that look = perfect. just simply gorgeous photos! 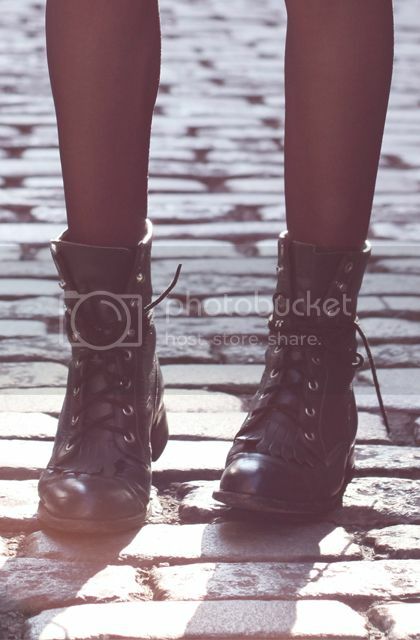 I love those boots, been trying to find a similar pair with no luck! Wat zie er leuk uit, echt zo’n schattig jurkje! Ik zet je bij mijn daily blogroll! it looks good! the shoes, the hat – great together! i am from northern europe too – where abouts? your outfits never cease to amaze me. Hi hun!!!! that dress is amaaazing!!! love it! love the complete outfit!!!! the boots are perfect! In love with this outfit !!! Absolutely adore these boots – they’re tough and dainty at the same time, and make me start to go off my own!